I haven’t written about my art class since last June but that doesn’t mean we haven’t been doing art. When we resumed in September it was a smaller class, just 3½ members. We started off with some drawing and sketching exercises and then moved into an acrylics unit. I am not very comfortable with acrylics and despite my reading and practising I didn’t feel that I was able to guide my students very well. We continued doing some sketching each week and worked on two landscapes in acrylic: one realistic and the other with a monochrome colour scheme plus a black silhouette image. Just before Christmas we signed up for a pottery class and created quite a selection of gifts as well as a few pieces to keep ourselves. During our first lesson we created bowls and platters, large and small. Our teacher showed us how to make mugs the second week and we created some candle holders as well. 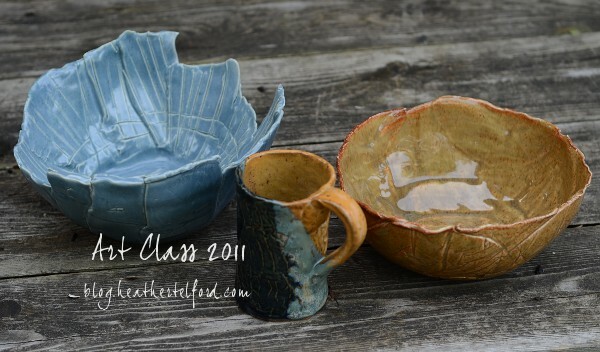 During the final week we glazed all the pieces that had survived the kiln; there were a few casualties. Everyone enjoyed doing pottery so we hope to do it again and include some lessons on the wheel. After Christmas we returned to drawing exercises, both still life and faces. We had been drawing before Christmas as we always began with a warm up exercise of one sort or another. 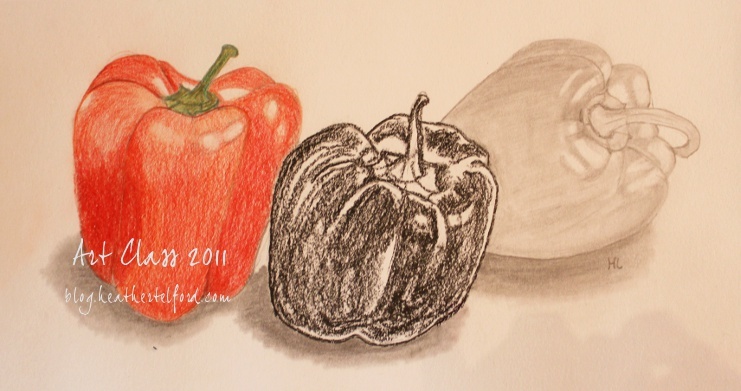 One of our first still life subjects was a classic one given to me by every art teacher I ever had and which I see again and again in books: the humble capsicum, or, as they say here, pepper. I expected complaints from my class at being asked to draw vegetables but everyone enjoyed the exercise as we did them in pencil, charcoal, watercolour pencil and fine tip marker. Over several weeks we also did lemons, shoes and toy cars before the artists chose a few fruit or vegetables to create their own still life arrangement to draw. Practising drawing faces turned out to be difficult but quite amusing at times. We used the guidelines given in various books to get our proportions right but also used each other as models. It is safe to say that most of our sketches were hardly flattering. It was a very good exercise however and we now know more the relative positions and sizes of all the facial features. After completing our faces unit each of the three girls in the class embarked on a project of their own choice to be entered in the Young at Art competition held by the City of Ottawa. The competition is open to 12-19 yearolds. A14 chose to do some digital art using the Bamboo we gave her for Christmas. 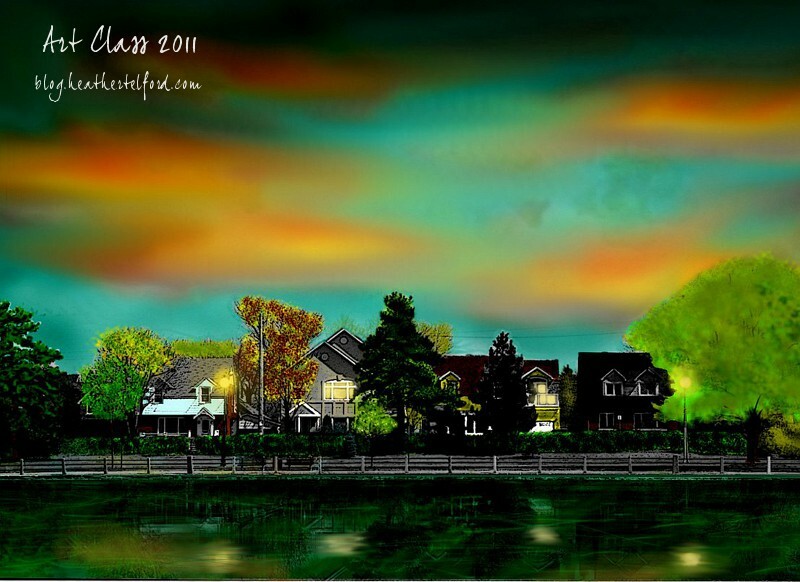 She took a photograph of the canal in winter, desaturated it and turned it into a spring or summer scene at dusk. 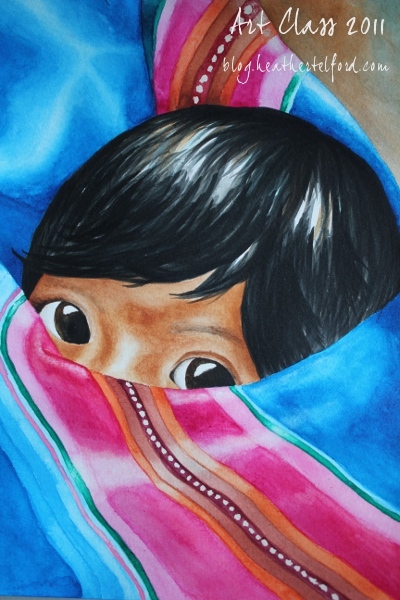 P16 chose to paint a watercolour of a Peruvian child bundled in a traditional blanket. H13 tried several ideas before settling on one of the projects we had done in class: capsicums drawn using charcoal, watercolour pencil and graphite pencil. All three submissions were very well done but unfortunately only a selection are picked for display and winners are chose from those displayed. A14’s digital print Reflections at Dusk was chosen as the winner this year in the junior level of the “Other Media’ category. Our last unit for the year was abstract art. The first task required everyone to choose a colour scheme, either cold or warm, and a shape to be repeated throughout the abstract design. Most of us tried several different approaches to this task. The second abstract project required a mass of liquid coloured paint, again in a cool or warm colour scheme, into which imprinted different textures. This entry was posted in Hand made, Homeschooling and tagged Art on June 25, 2011 by Heather. A very interesting and enjoyable blog. We were delighted to see the various items of work – all of a high quality. The capsicum particularly caught our eye. Is that H or P with L16 in the ‘heads down photo? That is actually H & P in the “heads down picture” in their well lit dining room where we did our art lessons. L16 did not do art this year.